Your skin type is typically what you’re born with. While your skin can go through different phases or react based on the weather or circumstance, your skin’s natural tendencies are driven by your skin type. Very broadly speaking, there are Dry, Oily, Normal, Combination and Sensitive skin types. Having said that, there are many nuances of each skin type. We’ll be building this section out to dig into the details! Wintertime is often associated with the holiday season, snowstorms, comfy sweaters–and dry skin. Since the air becomes drier when temperatures cool off, our skin follows suit. This is completely normal and happens to most people. But what if your skin shows signs of dryness all year round? This is a result of your skin type, not a shift in the weather. Dry skin occurs when the skin’s sebaceous glands to not produce enough oil to properly hydrate and protect the epidermis. This lack of oil can be caused by a variety of factors, like harsh soaps, weather, sun exposure, conditions like eczema, or genetics. It’s important to focus on hydration, as allowing dry skin to go untreated can lead to premature aging and even infection. Dry skin is usually accompanied by a persistent, uncomfortable itchy, tight feeling that often leads to redness, irritation, and inflammation. Sensitive skin and dry skin are closely linked. Often, if your skin appears rosy and sensitized, this may be an indication that you have dry skin. However, you can have dry skin and not be sensitive as well. If you often experience this feeling after showering or cleansing your skin, the water you are using is too hot and the products are too harsh. Since the skin is already lacking oil, when it is exposed to extreme temperatures or stripping chemicals, it is especially vulnerable. While a steamy shower is a relief in the dead of winter, and a stripping cleanser may be the only thing that makes your skin feel clean, they are often the cause of dryness and sensitivity. If you look closely at the mirror, you may see things like a grey cast, or dullness. Since dryness causes the skin to flake, the complexion will appear sallow and lack radiance. This is the result of dead skin cells still clinging to the skin’s surface. While many obsess over the size of their pores, if you have dry skin you this may not be a problem. Since dry skin produces less oil, generally, the pores are smaller than average. If you see fine lines or wrinkles forming around your eyes or mouth when you smile, then this is another sign you have dry skin. Because there is little oil present on the skin, it is more prone to developing fine lines earlier than average. Your skin may also lack firmness and/or feel thin. When skin is dry, the barrier function is compromised. The barrier function of the skin is made up of lipids (fats) that protect the skin from moisture loss, free radical damage, and bacteria. When the skin is dry, this the barrier function is weak, leaving the skin more vulnerable to harsh weather conditions, drying products, and other stressors. While conventional skincare wisdom teaches us to shy away from oil to prevent breakouts, oil is the remedy to dryness. Almost every symptom of dry skin can be alleviated with oils like argan oil, jojoba oil, and avocado oil. They are also nourishing and vitamin rich, which will help to repair past damage. Be sure to treat your skin with gentle products and exfoliate a few times a week to remove dead skin. Break free of your old and detrimental habits like hot showers and aggressive skincare products–they do more harm than good. This will finally give your skin the coveted glow we all seek. There’s a fine line between having glowing skin and having shiny skin. If you find you often cross that line, you probably have oily skin. Maybe this is the case in the summer, however if you find that the sheen sticks around even in the dead of winter this is another indication that you have oily skin. The skin begins producing more oil around puberty, when our hormone levels increase. If shiny skin has stuck around past puberty, then your skin type is oily. Oily skin can also be caused by using stripping products, genetics, climate, and dehydration. When the skin is oily, the sebaceous glands produce too much oil, which can lead to issues like clogged pores, blackheads, and breakouts. While oily skin is not always accompanied by blemishes, you may find that you are more breakout prone if you have oily skin. This is the result of excess oil, dead skin, and other debris building up in the pores. When this occurs, bacteria is also more likely to thrive, which worsens acne. You may find that you are plagued with enlarged pores if you have oily skin, whether you are breakout prone or not. Since the oil glands are hyperactive, more oil tries to pass through the pores than normal–this causes pores to become congested, making them appear larger. This issue is generally most prominent in the t-zone area. Sometimes oily skin is caused by dehydration. If your skin is oily yet feels rough or dry when you touch it, this is an indication that your skin lacks water. When the skin is dehydrated, the sebaceous glands mistake this deficiency in water for a shortage of oil. Since the sebaceous glands are meant to keep our skin hydrated and protected, they go into overdrive, producing more oil to alleviate the issue. Other indications that this could be the cause of excess oil are flakes, breakouts, and small lines on the forehead. Also, if you find makeup does not last long even if you use a matte foundation with powder, then you have oily skin. Since makeup products tend to have an oil base, the oil in your skin breaks down product, as oil attracts oil. When your skin is balanced and hydrated, makeup should last far longer. If you have oily skin, you may have been instructed to use harsh, stripping products to rid your skin of shine. However, this conventional wisdom only serves to worsen the problem. As we mentioned earlier with dehydration, when the sebaceous glands sense that there is a deficiency of moisture on the skin, they produce more oil to compensate. So while using stripping products may seem to rid the skin of excess oil for the moment, this is temporary, and even causes more breakouts. Be sure to use a gentle, foaming cleanser to balance skin and a lightweight gel moisturizer to keep the skin hydrated. Using a clay mask a few times a week will help to keep excess oil at bay, unclog the pores, and do away with blackheads. Keeping blotting papers on hand and using mattifying makeup products will also help to keep oil at bay, but adjusting your skincare routine will make the most difference in achieving glowing, non-greasy skin. People spend a lot of time and money seeking elusive normal skin. Normal skin is well nourished, hydrated, bright, and glowing. It shows no signs of excess oil, dryness, or breakouts. If you frequently get compliments about your skin from strangers, you probably have normal skin. No wonder this is the skin type everyone is after. While most people’s teen years are plagued with skin woes like acne and excess oil, you maintained the baby soft skin from childhood. Perhaps you had skin issues in the past, but after aging out of adolescence your skin calmed down and balanced out. You rarely have a breakout–if you do, it is likely linked to hormones and passes within a few days. Your pores are a normal size, not too large, not to small. They may not be invisible (because this is impossible) but they are certainly minimal. They are not congested and you do not have blackheads. If you have normal skin, your skin should feel soft and supple. You should not experience rough texture, flakiness, or irritation. Your skin type remains pretty stable throughout the changes in weather. Even if it is slightly oilier in summer or drier in winter, a quick fix restores your skin back to normal. Although your skin is normal, you may have other issues like hyperpigmentation or fine lines. Hydration is also crucial, as even normal skin can become dehydrated. If your skin is normal, the moisture/oil levels are balanced. There is not too much oil as with oily skin, or a lack of oil, as is the case with dry skin. Be sure to use non-stripping products and not to light, not too rich moisturizers to maintain balance. If you have normal skin, be thankful, but do not be complacent. Cleanse, tone, moisturize, and apply SPF every day at the bare minimum. You should also add an antioxidant serum to prevent collagen breakdown and signs of aging. Since your skin is already balanced, your focus should be prevention and maintenance. If your skin has a glow that is not an oily shine, and is not dull or sallow, then your skin is normal. It’s rare, but it happens, and you likely hit the genetic lottery or have been diligent in caring for your skin from an early age. Either way, do not neglect your skin just because it currently does not have any issues. This will eventually catch up with you as you age and your body changes. If you’ve done all the research into what your skin type is and haven’t been able to come up with a conclusive answer, you may have combination skin. Combination skin is becoming more and more common as factors such as pollution and sun damage influence our skin type in different ways. Combination skin means that in different areas of the face, your skin type is different. In general, the most common form of combination skin is characterized by oily skin in the t-zone, and dry cheeks. 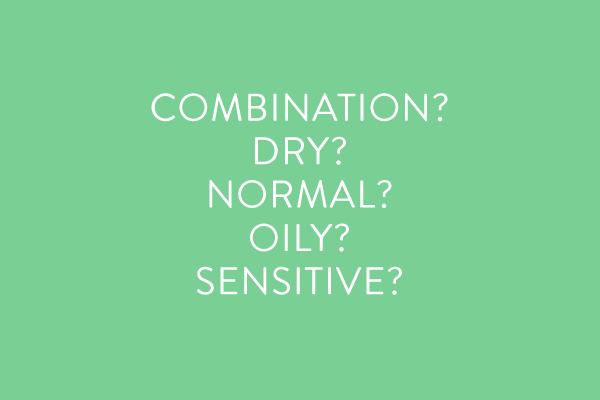 However, it is possible to have many different combinations, such as oily/normal, dry/normal, etc. A surefire way to tell if your skin is combination is if your skin type changes frequently: somedays it may feel oilier, other days drier. This is especially highlighted when the seasons change–in the summer, you are likely to be more oily, and in the winter, as the air dries up, more dry. If your pores are larger in the t-zone and practically non-existent in the u-zone (the edges of the face), then your skin type is combination. You may also notice more blackheads and clogged pores on the nose and in the middle of your face, while your cheeks, jaw, and chin are flaky, parched, or irritated. This is because oil glands tend to be more active in the middle of the face, yet not as much in the outer regions. Essentially, what causes combination skin, like many skin issues, is a lack of balance. If the skin is stripped or dehydrated, the oil glands may overproduce in some areas and underproduce in others, causing both oily and dry patches of skin. Dehydration can be a huge factor in this inbalance. Not only does dehydration cause the skin to feel tight, flaky, and irritated, it also stimulates oil production. When skin is dehydrated, our oil glands mistake this deficit of water for a lack of oil and produce more to compensate. Since, as we mentioned, your oil glands are more active in the t-zone, you may notice your skin is very oily there, yet flaky and dry elsewhere. Or, your skin may be oily yet feel very dry to the touch–this is a telltale sign of dehydration as well as combination skin. In most cases, combination skin is dehydrated or stripped, which is what causes disequilibrium. To combat this, focus on using products that have both humectants and astringents in them. Humectants bind moisture from the deeper layers of the skin to the surface to hydrate and maintain supple, glowing, and youthful skin. Astringents curb oil production by toning the pores. They also remove congestion and blackheads. Be sure to use astringents that are not drying, like tea tree or witch hazel, as using something harsh will worsen combination skin. While combination skin may seem like it’s impossible to control, balancing out your skin is certainly attainable. It is crucial to not treat one area of your skin at the expense of the other: for example, using intense, oil absorbing products will further strip the dry areas of your skin. In contrast, using products that are too moisturizing will make your t-zone even oilier and clog your pores. Focus on using lightweight yet effective products to restore balance. If you are very skeptical about trying new skincare products based on a bad reaction you had in the past, or tend to prefer products without chemicals or fragrance, you probably have sensitive skin. Your skin may often appear red and/or feel itchy, burning, and irritated on a consistent basis. After you wash your face, your skin may feel tight and inflamed. You may often experience dryness in addition to irritation. Your skin may become particularly red and stripped during the winter months, when the air is dry and harsh winds wreak havoc on skin. If your skin often becomes itchy and flaky during the colder seasons, then you have sensitive skin. If you cannot incorporate a new product into your regimen without breakouts appearing, then you likely have sensitive, reaction skin. Sensitive skin does not like change and will often react poorly when a new product is introduced. However, there was likely a reason that your skin didn’t like it: it may have had fragrance or too many chemicals. Your skin may appear flushed after eating spicy food or consuming alcohol. If you have breakouts, they are especially red and hurt when touched. Exfoliation, particularly with physical scrubs, can cause even more burning and redness. Even chemical exfoliators lead to raw, irritated skin. Thin skin is another sign of sensitive skin. This is due to the fact that when your skin type is sensitive, your natural barrier function is weak. The barrier function strengthens the skin and prevents water loss. However, when the barrier function is compromised, the skin is sensitive, dry, weak, red, and bacteria thrives (which can lead to breakouts). If you have a condition like eczema, rosacea, or psoriasis be extra cautious and focus on using lipids (or oils) to hydrate skin. Incorporate humectants and barrier strengthening ingredients like aloe, ceramides, and hyaluronic acid. Be aware of what ingredients have caused a negative reaction in the past and make an effort to avoid them.